As the first step of digital India, e-governace activities has been implemented in few key departments. One of the useful step, is to check your name, verify and apply for a change in Voter's list through online itself. Enter the Captcha code to verify you are a human. If your name is in Voter's list, then it will be displayed along with your Address, Age, Polling booth etc. 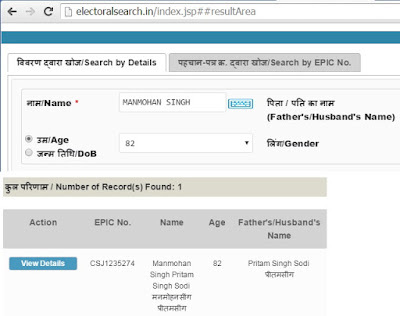 If you have voters card in your hand, then you can search using the option, Search by EPIC number very easily. You can apply for change in Address or name in the same website through form 8, and uploading the valid photo proof and address proof.